LilyRunner is an application that helps you typesetting music by LilyPond. Specifically, LilyRunner invokes the command-line version of lilypond, and if compilation is successful open the resulting PDF file. It also recognizes clicking on the musical symbol on the PDF file, and opens the source file with an external editor and moves the insertion pointer to the appropriate position. Copy the application to the "/Application" or "~/Application" folder. Launch the application, and select "LilyRunner" -> "Preferences". Select the LilyPond application. You can specify either the application package (LilyPond.app), or the command-line executable directly (such as /usr/local/bin/lilypond). Select the Preview and Editor applications. Edit the script to respond to click on PDF. When the url textedit://(file-path):line:column is clicked on the PDF viewer, this script is called with the file path, the line number and the colun number (both starting from 1) as the arguments. Drag and drop the lilypond source file on the LilyRunner application. The LilyPond begins to compile, and if it is successful the resulting PDF file is opened with the Preview application. Alternatively, you can use "File" -> "Open and compile..." menu command, or an AppleScript 'tell application "LilyRunner" to open FILE'. Use "File" -> "Open and update syntax" menu command to select the source files. Alternatively, you can use "File" -> "Update syntax" menu command while the lilypond log window for that source file is still open. Another way is an AppleScript, 'tell application "LilyRunner" to update syntax (FILE as alias)'. Click on one of the musical symbols, then LilyRunner is invoked, opens the source file with the external editor, and move to the line/column position. Use "File" -> "Create PNG from This File" menu command while the lilypond log window for that source file is still open. The resolution of the PNG file can be set in the Preference window. 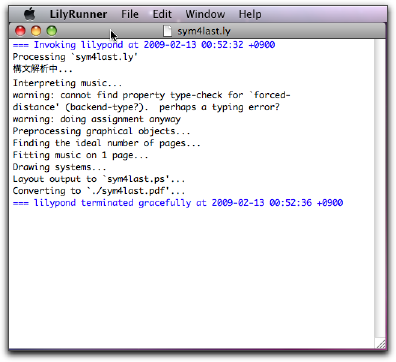 Another way is an AppleScript, 'tell application "LilyRunner" to create PNG (FILE as alias)'. LilyRunner is distributed under the terms of the "Modified BSD License." Support creation of PNG files.